The Second Estimate of our 4th Quarter GDP from the Bureau of Economic Analysis indicated that our real output of goods and services grew at a 1.9% rate in the 4th quarter, unrevised from the advance estimate reported last month, as personal consumption expenditures were greater than initially estimated, but both private and state and local investment grew less than was first estimated. In current dollars, our fourth quarter GDP grew at a 3.9% annual rate, increasing from what would work out to be a $18,675.3 billion a year output rate in the 3rd quarter to a $18,855.5 billion annual rate in the 4th quarter, with the headline 1.9% annualized rate of increase in real output arrived at after an annualized inflation adjustment averaging 2.0%, aka the GDP deflator, was applied to the current dollar change. While we cover the details below, remember that the press release for the GDP reports all quarter over quarter percentage changes at an annual rate, which means that they're expressed as a change a bit over 4 times of that which actually occurred over the 3 month period, and that they only use the prefix "real" to indicate that the change has been adjusted for inflation using prices chained from 2009, and then calculate all percentage changes in this report from those artificial 2009 dollar figures, which we think would be better thought of as representing quantity indexes. For our purposes, all the data that we'll use in reporting the changes here comes directly from the pdf for the 2nd estimate of 4th quarter GDP, which we find linked to on the sidebar of the BEA press release. Specifically, we refer to table 1, which shows the real percentage change in each of the GDP components annually and quarterly since 2012; table 2, which shows the contribution of each of the components to the GDP figures for those months and years; table 3, which shows both the current dollar value and inflation adjusted value of each of the GDP components; table 4, which shows the change in the price indexes for each of the components; and table 5, which shows the quantity indexes for each of the components, which are used to convert current dollar figures into units of output represented by chained dollar amounts. The pdf for the 4th quarter advance estimate, which this estimate revises, is here. 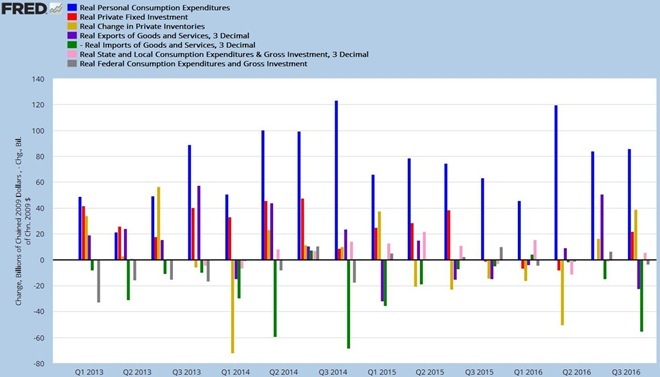 Real personal consumption expenditures (PCE), the largest component of GDP, were revised to show growth at a 3.0% annual rate in the 4th quarter, up from the 2.5% growth rate reported last month. That growth rate was arrived at by deflating the annualized dollar amount of consumer spending with the PCE price index, which indicated consumer inflation at a 1.9% annual rate in the 4th quarter, which was revised from the 2.0% inflation rate that was applied to PCE in the first estimate. Real consumption of durable goods grew at a 11.5% annual rate, which was revised from the 10.9% growth indicated in the advance report, and added 0.83 percentage points to GDP, as real output of motor vehicles rose at a 16.0% annual rate and accounted for 0.39 of that growth. Real consumption of nondurable goods by individuals rose at a 2.8% annual rate, revised from the 2.3% increase reported in the 1st estimate, and added 0.40 percentage points to 4th quarter economic growth, as lower consumption of energy goods was the only drag on the quarter’s non-durables growth. In addition, consumption of services rose at a 1.8% annual rate, revised from the 1.3% rate reported last month, and added 0.81 percentage points to the final GDP tally, as an increase in the real output of health care services at a 5.8% rate accounted for three-fourths of the 4th quarter increase in services. Seasonally adjusted real gross private domestic investment grew at a 9.2% annual rate in the 4th quarter, revised from the 10.7% growth estimate made last month, as real private fixed investment was revised from growth at a 4.2% rate to growth at a 3.2% rate, while real inventory growth was smaller than previously estimated. Investment in non-residential structures was revised from shrinking at rate of 5.0% to shrinking at a 4.5% rate, while real investment in equipment was revised to show growth at a 1.9% rate, revised from the 3.1% growth rate previously reported. In addition, the 4th quarter's investment in intellectual property products was revised from growth at a 6.4% rate to growth at a 4.5% rate, and the growth rate of residential investment was revised from 10.2% to 9.6% annually. After those revisions, the decrease in investment in non-residential structures subtracted 0.12 percentage points from the economy's growth rate, investment in equipment added 0.11 percentage points, investment in intellectual property added 0.18 percentage points , and growth in residential investment added 0.35 percentage points to the change in 4th quarter GDP. Meanwhile, the growth in real private inventories was revised from the originally reported $48.7 billion in inflation adjusted growth to show inventory growth at an inflation adjusted $46.2 billion rate. That came after inventories had grown at an inflation adjusted $7.1 billion rate in the 3rd quarter, and hence the $39.1 billion positive change in real inventory growth from the 3rd quarter added 0.94 percentage points from the 4th quarter's growth rate, revised from the 1.00 percentage point addition from inventory growth reported in the advance estimate. Since growth in inventories indicates that more of the goods produced during the quarter were left in a warehouse or sitting on the shelf, their increase by $39.1 billion meant that real final sales of GDP were actually smaller by that much, and hence real final sales of GDP grew at a 0.9% rate in the 4th quarter, which was statistically unchanged from the advance estimate, compared to the real final sales increase at a 3.0% rate in the 3rd quarter, when the change in inventories was smaller. The previously reported decrease in real exports was revised lower with this estimate, but the reported increase in real imports was revised higher, and as a result our net trade balance was little changed from what was previously reported. Our real exports fell at a 4.0% rate rather than the 4.3% rate reported in the first estimate, and since exports are added to GDP because they are part of our production that was not consumed or added to investment in our country, their shrinkage subtracted 0.50 percentage points from the 4th quarter's growth rate. At the same time, the previously reported 8.3% increase in our real imports was revised to an 8.5% increase, and since imports subtract from GDP because they represent either consumption or investment that was not produced here, their growth subtracted 1.20 percentage points from 4th quarter GDP. Thus, our weakening trade balance subtracted a net 1.70 percentage points from 4th quarter GDP, the same GDP subtraction resulting from foreign trade that was indicated in the advance estimate. Finally, there was also a downward revision to real government consumption and investment in this 2nd estimate, as the real growth rate for the entire government sector went from a 1.2% rate to a 0.4% rate. Real federal government consumption and investment was statistically unchanged, however, as real federal spending for defense shrunk at a 3.4% rate and subtracted 0.14% percentage points from 4th quarter GDP, while all other federal consumption and investment grew at a 2.3% rate and added 0.06 percentage points to GDP. Note that federal government outlays for social insurance are not included in this GDP component; rather, they are included within personal consumption expenditures only when such funds are spent on goods or services, indicating an increase in the output of those goods or services. Meanwhile, real state and local consumption and investment was revised from growth at a 2.6% rate in the first estimate to growth at a 1.3% rate in this estimate, as state and local investment spending grew at a 7.7 rate and added 0.14 percentage points to 4th quarter GDP, while state and local consumption spending was little changed and had no statistical impact on GDP. Our FRED bar graph for GDP below has been updated to reflect these latest GDP revisions. Each color coded bar shows the real inflation adjusted change, expressed in billions of chained 2009 dollars, in one of the major components of GDP over each quarter since the beginning of 2013. In each quarterly grouping of seven bars on this graph, the quarterly changes in real personal consumption expenditures are shown in blue, the changes in real gross private investment, including structures, equipment and intangibles, are shown in red, the quarterly change in real private inventories is in yellow, the real change in imports are shown in green, the real change in exports are shown in purple, while the real change in state and local government spending and investment is shown in pink, and the real change in Federal government spending and investment is shown in grey. Those components of GDP that contracted in a given quarter are shown below the zero line and subtract from GDP, those that are above the line grew during that quarter and added to GDP; the exception to that is imports in green, which subtract from GDP, and which are therefore shown on this chart as a negative, so that when imports shrink, they will appear above the line as an addition to GDP, and when they increase, they'll appear below the zero line. It's clear from this graph that the drop in exports and the surge in imports were the major negatives in the 4th quarter, and that with the increases in personal consumption expenditures, investment and inventories, the 4th quarter could have topped the third had our trade deficit merely remained flat.. Truly, this revision was deceptive since the end result was no change and most probaby missed the revisions and how the trade deficit ate up all of the gains. Here is the original GDP release overview or comparison's sake. Let's just hope Trump gets somewhere with improving the trade situation. So far, he caved on US products for a pipeline, imported, not U.S. steel and seems to be just wrecking the environment as an accomplishment while liberals chant racism and shove unlimited immigration down the throats of America. Somehow I don't think the GOP is going to give America what it needs to reduce costs, universal single payer health care, so if he caves on Trade the silver lining is gone. Seems to be disappearing very fast. Surprise, surprise, surprise so the skank businessman who‘s been ripping people off for years has given the pipeline steel contract to a Russian oligarch who is a close associate to Putin. Democrats, as you pointed out, are doubling down on kicking Americans while they’re down in their support of illegal immigrants and refugees. Democrats are the only Party who could jump off a bridge and miss the water. Republicans would give tax credits to a Russian gangster to build the bridge, charge a toll and pollute the water.